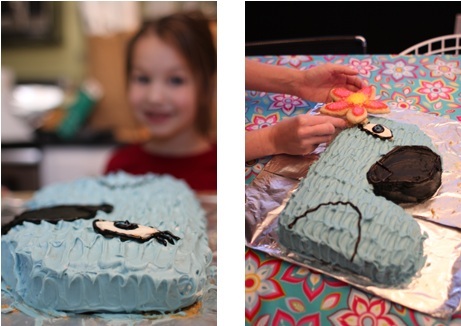 Can we please get excited about the fact that we made a cake in the shape of a blue bird from the movie Rio? Small victories my friends. They matter. As you may have read last week I accepted the challenge of duplicating a Jewel cake for Alex’s birthday party, found via a Google Image Search. Not that big of a deal until you consider the fact that I don’t make cakes in the shape of cake pans let alone in the shape of birds. So please excuse me while I overenthusiastically celebrate this moment. And let me also just say that Fun-fetti cake from Pillsbury is amazing and delicious and should be a part of every celebration. I should also add that my husband and daughter are full of brilliant ideas and this wouldn't have been possible without their helpful suggestions. As far as birds go, this was the tastiest one I have ever consumed. If I ignore the fact that 10 kids aided in blowing out the candles and abandon all my germ-a-phobic ways, it is safe to say I thoroughly enjoyed devouring this treat. And the birthday girl was pretty please too. As it turns out, making cakes from boxes isn’t all that hard. Sure, it is pretty creepy looking and not quite as glamorous as the original --- but that's beside the point. I was just happy none of the kids asked "what is that supposed to be?" Because then I would have had to ask them to leave. Seriously.